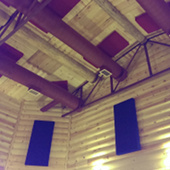 The results of the acoustical panels have been well received. The children were telling us that it does not echo anymore when they scream. Several teachers were very pleased, and they look great. Thank you so much, and I will send you more pics upon completion. Right now half the gymnasium is completed. 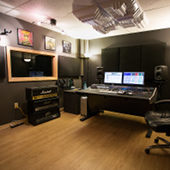 ATS has totally changed Dexters Lab Recording and its listening environment. I used to have to check my mixes in my car and other systems. Now i get all my frequencies correct first try since my room is so focused! Here’s a picture of my studio with the panels installed. 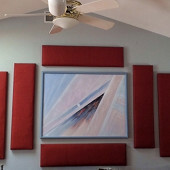 I purchased the acoustic foam panels to try to reduce the sound coming from a scroll compressor in my A/C outside unit. I lined a 5 gallon plastic bucket with a foam panel, trimming where needed, and dropped it upside down over the compressor, cutting a slot in the bucket where needed. I then duct taped the bucket to close the slot as much as possible. It worked beyond my expectations and much better than the dedicated sound blanket. Thank you for getting back to me. I was able to hang the panels with hardware from the hardware store. They are working well for our needs. We opened a medical clinic and we needed something to tamper sound from bouncing around as you could hear the patients in the exam rooms. I ordered four panels to see if they would work and they do!! Therefore I just ordered five more to hang throughout and in the rooms and our neighbors in the same building are going to order some for their area. Thanks again!! 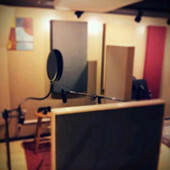 A few pic’s from our Grammy Award Winning producer, Chuck Ebert’s studio. 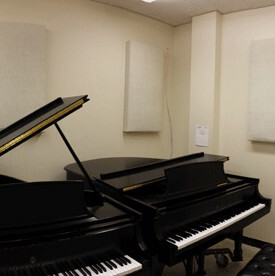 ATS used exclusively for the studio acoustic panels. Thanks! While I was happy with the look, general construction quality, and acoustic effectiveness of your panels, I’m compelled to report a few problems with my order. First, and foremost, my order (which was supposed to contain approx. 23 panels with BEVELED edges) was shipped with all SQUARED edges. The ’’QC’’ field on the card attached to each panel was uninitialed. Second, the mounting templates included with my order were not able to be used to flush-mount open-backed panels. Accordingly, I had to go through the effort of creating custom templates. Third, at least one of the panels arrived severely warped- rendering it unable to be mounted. Perhaps you should begin using plywood for your frames, as it is less prone to warping (if you haven’t done so already). Finally, while I’m aware that anyone can make mistakes, the enormous cost and inconvenience suffered by the customer in returning defective/incorrect items to you essentially prevents them from doing so. As a result, the customer is stuck with those items. Please please please make more efforts to ensure that the panels shipped are the same as those ordered. Thank you. Reply Comments: Thank you for your comments and feedback, Daniel. We apologize for letting you down, and we would sincerely like to resolve this problem. I’ve talked with our Inside Sales Engineers, and they will contacting you immediately. Thanks again, Daniel. Installation of ATS Acoustic panels in microsuede fabric in the tasting room at Pour WIne Bar & Bistro. After all these years your panels still works great, look great, and I still get compliments on the layout. 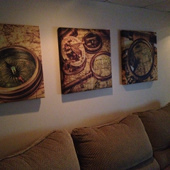 I hung them in a timeless fashion that is not only visually pleasing, but they also complement my music. Thank you kindly, David. I received the panels today, and I am thrilled. My husband loves vintage maps and museums. The panels will make his "man cave" more elegant and make his investment in his sound equipment more worthwhile. The template provided was extremely helpful. The art panels are a great 2 in 1 solution. We have already received requests on the manufacturer of the panels, because they came out so nicely. I am especially pleased with the subtle black and grey stripes on the panel ’Love one another’. Thank you for a job well done! 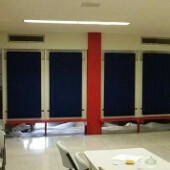 We installed the panels in our newly constructed Multi-Purpose Room. 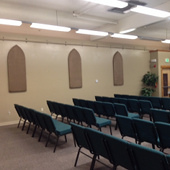 It was very successful and we have received numerous positive comments on how well the acoustic panels worked. The panels look great too. Panels arrived today and thanks. Real nice! Hi John, I can’t thank you enough for getting the panels in my hands so quickly. Right in the middle of the Christmas rush even! 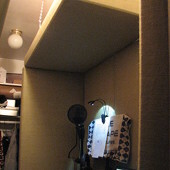 As you can see in the pic I moved the booth to the side wall and hinged the right side panel for access ease. This is the best pic I can get without buying new wide angle camera lens. All recording components fit just right, with room to comfortably move and perform. Two days ago I recorded and submitted my first audition reel, we’ll see how that goes. I have to tell you though, it sounds GREAT! Thanks again to you and everyone at ATS for a great product and service.